Sitting directly on Long Bay Beach, Casa Varnishkes is an opulent, gated estate perfect for families or larger group gatherings. With nine bedrooms, a large swimming pool, a gym, and a private sports court, you’ll have the opportunity to relax or stay active. Whether you’re an athlete, a bookworm, or a beach bum, you’ll love vacationing at Casa Varnishkes. Casa Varnishkes is a gated estate designed to host weddings, anniversaries, and luxury vacations. This nine-bedroom villa is located directly on Long Bay Beach, and offers every amenity for an unforgettable vacation. A 7,000 sq. ft. main house and a three-bedroom guest house dominate Casa Varnishkes’s 2.5 acres of beachfront property. The estate’s outdoor space is extensive, and there are multiple areas to lounge, sunbathe, and dine al fresco. At the main house, guests can soak up the sun on the terrace and swim in the 40 ft. long freshwater pool all day. There’s no need to go inside, since snacks and drinks can be stored and prepared in the outdoor kitchen. The outdoor kitchen has a massive BBQ grill, a wet bar, a mini fridge, expansive countertops, a farmhouse sink, and a breakfast bar, with a stunning ocean view. A wooden staircase leads down to Long Bay, where guests can go snorkeling, kiteboarding, or swimming. There’s even a trio of umbrellas and lounge chairs if anyone would rather relax on the beach than in the water. Travelers with a competitive streak can head over to the sports court to play tennis or basketball. Exposed beam ceilings, sliding glass doors, and large bay windows bring ample sunlight into Casa Varnishkes, and full air-conditioning cools the space. The open floor plan encompasses the living room, dining table, and gourmet kitchen. The kitchen is fully equipped with stainless steel appliances, a breakfast bar, coffeemakers, and tons of counter space. Guests can study or work using the office’s WiFi and printer, or watch movies on the media room’s flatscreen TV and entertainment center. A handicap accessible ramp facilitates wheelchair entry into the main level rooms. There are three bedrooms in the main house, up some steps from the parking area. One master is on the main level and two bedrooms are up a set of interior stairs. All three bedrooms have ensuite bathrooms. The two upstairs bedrooms would work nicely for parents or a nanny and young children. Both queen suites have an ottoman that converts into a bed, so there are several sleeping options. There are also three bedrooms that are accessed from the exterior. One queen suite is located next to the pool with an outdoor shower. Downstairs to the right of the pool, there’s a garden level king suite. To the left of the steps, by the main entrance of the house, there’s a second garden level bedroom with a queen suite, a living area, and a queen sleeper sofa. This suite sits below the master bedroom on the main level. Up the front entry steps, next to the pool, there’s a Queen ‘Pool’ bedroom above the lower garden level king bedroom. The large media room is across the patio. At the front of the house, there are three bedrooms above the garage with exterior staircase access. All three bedrooms are connected, and there’s one entrance in. 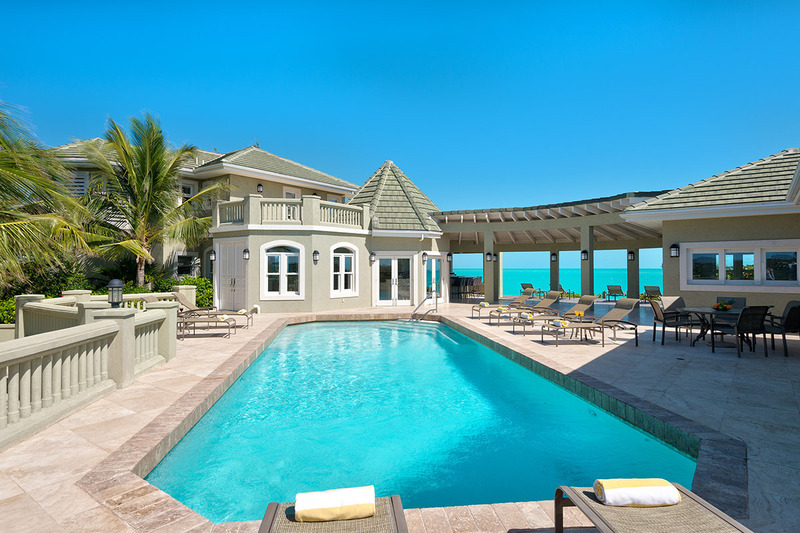 Casa Varnishkes has easy access to Grace Bay’s golf, gaming, shops, and restaurants. Grace Bay is a 15-minute drive, and Providenciales International Airport is only 20 minutes away. casa varnishkes turned out to be as good as it appears on the web site. everyone had a great time. only negative would be that the first ten yards getting into the water is a little rockey so recommend water shoes . the leeward beaches are close by also. definitely recommend that you get to the airport early if leaving on a weekend because that was quite a mess but that has nothing to do with varniskes.also be prepared for sticker shock at the grocery stores.